It is known to all that HD video formats, such as TS, TRP, TP, MTS, MKV, M2TS, TOD etc. provide us high-quality video with clear image and lossless audio. And videos in high-definition are indeed more appealing and attractive for video fans and movie lovers. 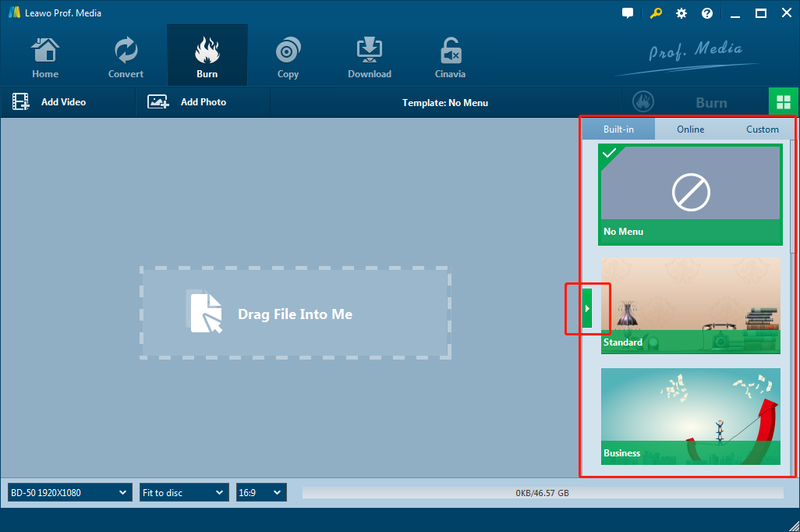 However, as everything has two sides, an HD file is in large size which occupies too much space on your computer and you will lose your files when your computer crashes. On such occasion, you’d better burn HD video to DVD concerning the safety of your HD video. Then, can you burn HD video to standard DVD so that you can playback on any DVD player at any time you like? Don’t worry. There is an HD to DVD converter—Leawo DVD Creator which will give your great help. ☉ Supports burning videos in all popular formats to DVD. ☉ Built-in video editing features. You can import videos to the HD to DVD converter in three ways: the first way is to click the “Add Video” button to load videos; the second way is to click the invert triangle buttons next to the “Add Video” button and then select to import the HD video folder you are going to burn; and the third ways is to directly drag and drop files to the program. After loading source video files, you could select subtitles and audio tracks from source videos, play back videos, etc. Set the output DVD disc type (DVD-5 or DVD-9), quality and aspect ratio (16:9 or 4:3) at the bottom. If you want to add disc menu to output DVD movie, you could choose from the right sidebar. If you want no menu, just select “No Menu” option on the right side bar after you load source videos. 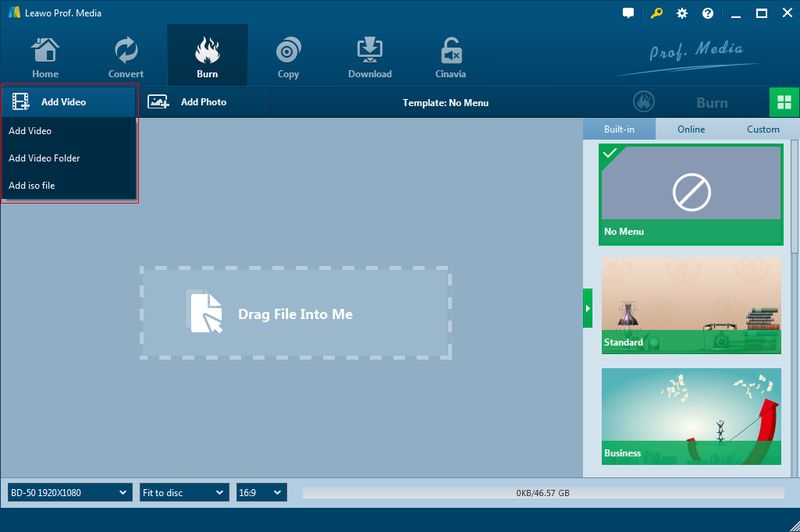 Note: Leawo DVD Creator offers you multiple preset disc menu templates in different themes like Standard, Business, Education, Childhood, Holiday, etc., which also allows you to DIY disc menu with your own images and audios. You could get instant preview of the menu you’ve selected. After setting disc menu, click the big green “Burn” button and enter the burning settings panel, on which you need to figure out Burn to, Disc Label, and Save to options. This DVD burning software actually offers you to edit loaded video files and make output DVD movies customized. You could right click a loaded video and then select Edit button on the right-click menu to enter the editing panel and then you are enabled to trim video length, add video watermark, crop video size, and adjust video effect as well as burn video to 3D DVD. You can click the “Burn” button on the popup burning settings panel to start burning videos to DVD when completing the burning settings. This DVD Creator would instantly start to burn and finish it in a few minutes. Now you have been well experienced in using this HD to DVD converter and how to use it to burn HD video to DVD. That is to say, by using Leawo DVD Creator, you can not only know how to make HD DVD but also be an expert on how to edit it to meet your different needs. To be concluded, when you are required to burn HD video to DVD, or the so-called HD 1080P to DVD, to prepare an HD to DVD converter like Leawo DVD Creator mentioned above and get familiar with usage of it, you can burn the videos of HD 1080P to DVD as immediately as you like. After that, you can enjoy yourself at any time and place with the burned DVD with its originally high-definition. Can you burn HD video to standard DVD then? If there is any question, Leawo DVD Creator is preparing for offering the solutions at any moment.